Gauri asks Anika not to marry Nikhil and follow her heart, which beats for Shivay. Gauri tells Anika that leaving things on fate won’t help, she should just go ahead and talk to Shivay. 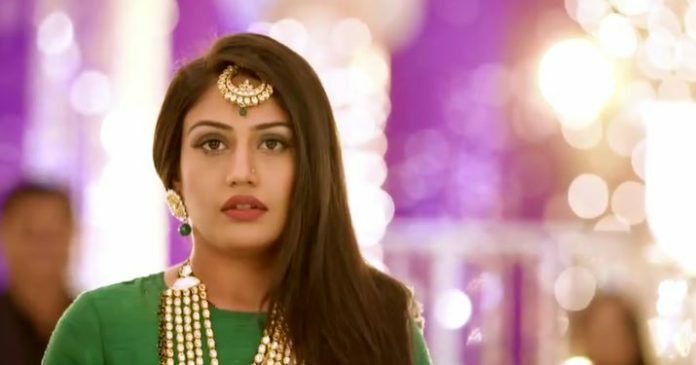 Anika tells Gauri that she isn’t willing to talk to Shivay, since she has no courage to ask Shivay about their marriage. Shivay tells Omkara that he has hurt Anika enough and now just wishes for her happiness. He believes that Anika loves Nikhil. He has no idea that Anika has developed feelings for him. Omkara asks him not to leave things on fate and just do something for himself and Anika. Shivay makes sure that all the arrangements of Anika’s mehendi are done well. Anika meets Shivay at his house, while he gets busy in managing some decorative lights. They get into a moment that builds up around them. Shivay wants to plan Anika’s wedding and do the best. Shivay and Anika’s feelings get realized by their siblings, who just wish them to acknowledge their feelings in time, before the marriage. Shivay asks Anika and her family to feel like home and settle down. He makes them stay comfortable. Omkara is happy that Shivay’s love story is forming his love story with Gauri too. He falls for Gauri. They share a beautiful moment while preparing for Anika’s mehendi. Priyanka pulls Omkara’s leg for falling in love. He denies about having feelings for Gauri, but gets happy in his heart. Gauri gets the shagun mehendi for Anika. Shivay attends the Mehendi function. He turns mesmerized with Anika. He welcomes Nikhil and his parents. He wishes the best for Anika and Nikhil. Shivay falls in trouble, but gets rescued. Anika calls him out, which makes the mehendi artist assume that Shivay is her would be husband. Anika and everyone else get stunned on seeing Shivay’s name in Anika’s palm. Nikhil and his mum find a chance to react. Shivay doesn’t know how could Anika make such a blunder. Anika tries to wipe out the mehendi so that Shivay’s name doesn’t get darker. She fails to erase his name from her life and destiny. Shivay gets Anika’s shagun mehendi on his hands. Nikhil turns upset with Anika. He then realizes that it was the artist’s mistake. He proceeds with the rituals. Omkara asks Shivay to take some time and consider the things happening, as the universe is conspiring to unite Shivay and Anika. Anika receives the Shagun from Nikhil’s family. Her sindoor gets spotted by them, who instantly hit her with their questions. Anika apologizes to Nikhil and tries to tell the truth about her marriage. Shivay doesn’t want Anika to say anything. He burns his hand to stop Anika from revealing anything. Everything gets revealed on its own when Anika leaves the rasam and runs to Shivay out of concern. Shivay punishes herself on seeing her cry. Anika realizes that he can’t tolerate her tears. Everyone cares for Shivay’s burn. 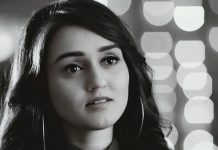 Anika gets confronted by Shivay. He asks her never to reveal Nikhil about their meaningless marriage. He asks her not to hurt herself again. He wants her to move on in life with Nikhil. He wipes off her sindoor, but she stops him from doing so. She tells him that she has decided to apply the sindoor, and left everything on fate. She is sure that destiny will play its role well. 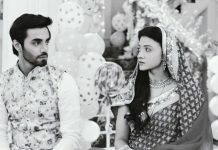 Will Shivay realize Nikhil’s truth and call off the wedding? Keep reading.